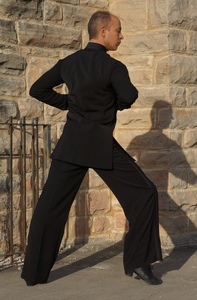 Peter is from "The Dotte" in Kansas City where he began his dance career more than 20 years ago. His training started while working for a man he greatly respected, the late Tom Champman at TC Dance International. He attributes much of his success to the valuable knowledge he has received from some of the many coaches he has worked with including Terry Irwin, David Kloss, Ahmed Hussein, and Bob Powers. Over the years Peter, alongside his beautiful wife Amy, Owners of La Roca Dance Studio, have received numerous awards, such as "Top Teacher" and "Top Studio". Peter and Amy now live at the beautiful Lake of the Ozarks where they teach both International and American styles of Ballroom and Latin Dance to their students. Peter believes that the most valuable characteristic of a good dancer is a strong work ethic. "If you work hard at mastering your technique and timing you can go as far as your heart desires." He is blessed to be a father of 5 wonderful children and owes the majority of his success to his wife who in dance terms "Keeps him in lock step".